In this tattoo, a number of natural elements have been used. The key focus is on the cross and the praying hands at the bottom. The enriched caricature with black ink looks elegant. Trees, birds and several other objects of nature have been used in the tattoo. This is a large and elongated tattoo, covering the entire forearm. 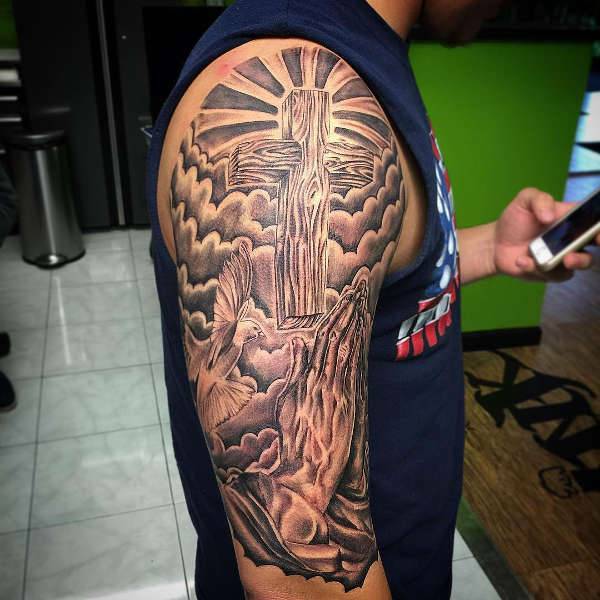 It features Jesus in a cross and a pair of praying hands at the top. The background is set with a complex radiation of rays from the cross. The thick lines of in are projected outwards and cover the hands. 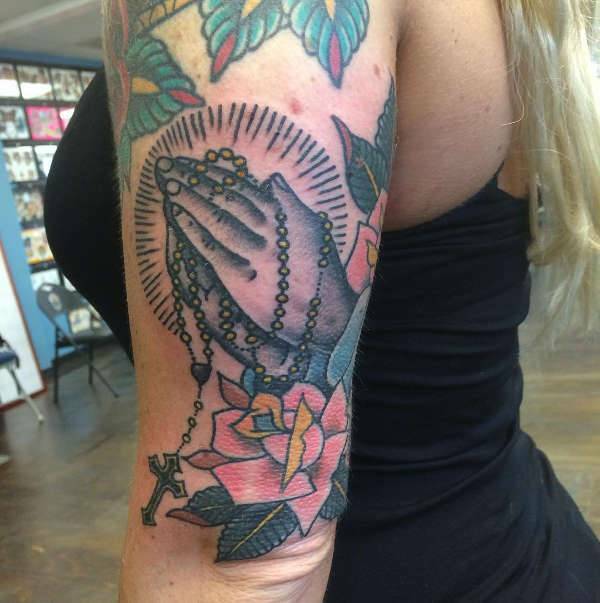 If you want to be a bit experimental with the praying hands tattoo design, you may add floral elements like rose to it. 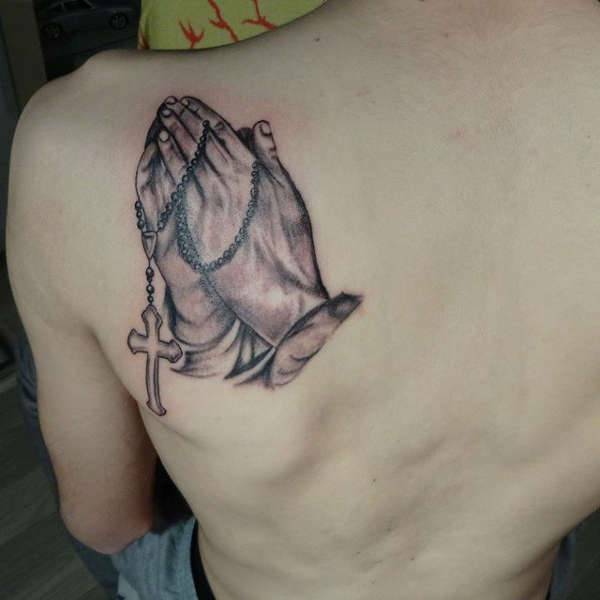 In this tattoo, the key focus lies on the praying hands. A beaded garland is entangled around it, and a cross is hanging from the garland. The pink rose looks bright and conspicuous at the bottom. Shoulder tattoos are popular in different parts of the world. This particular design may make you look elegant, with a pair of praying hands and a cross. The fine intricate shades in the hand makes the design sleek. The cross hangs from a garland wrapped around the hand. 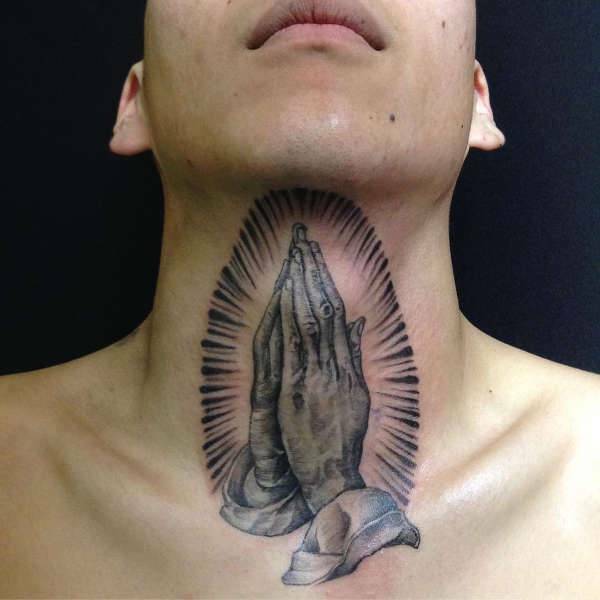 Neck tattoos are common among tattoo-lovers. To strike a change, go for a conspicuous pair of praying hands in the throat region. 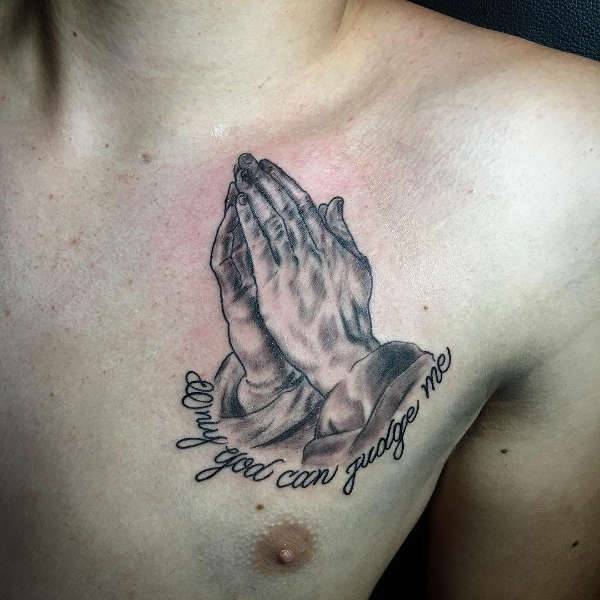 It is a delicate piece of art, with rich lines of ink and shows energy radiating from the pair of praying hands in all the directions. This particular tattoo design is ideal for the chest region. It is small and delicate, with sharp black lines and prominent edges. A semi-circular band of leaves mark the bottom of the tattoo. It is a simple yet beautiful style of incorporating tattoos above the heart. 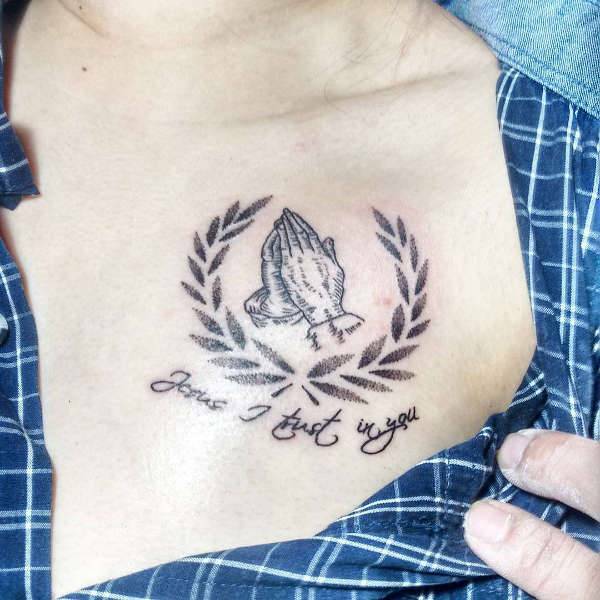 This tattoo comes with a quote. The pair of praying hands is marked with dark and light patches of ink. It is a sophisticated piece of art, without much caricature with the ink. Still, the inherent beauty of the tattoo makes it a classy choice. 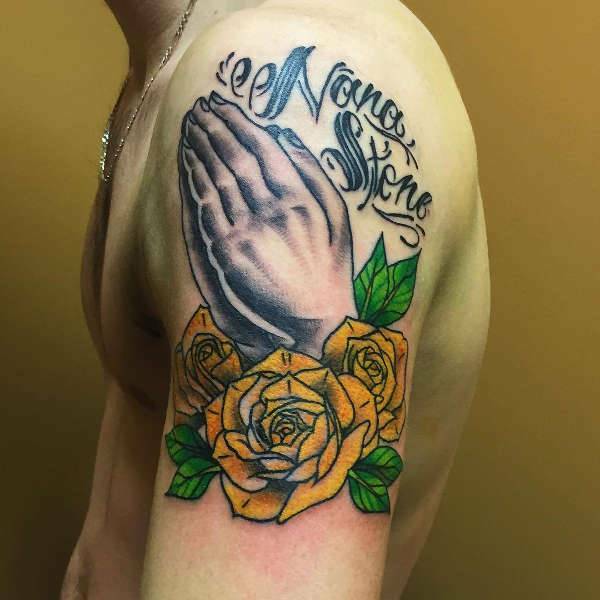 You may opt for this bright yet detailed tattoo for the arms. The pair of praying hands comes with two crosses. 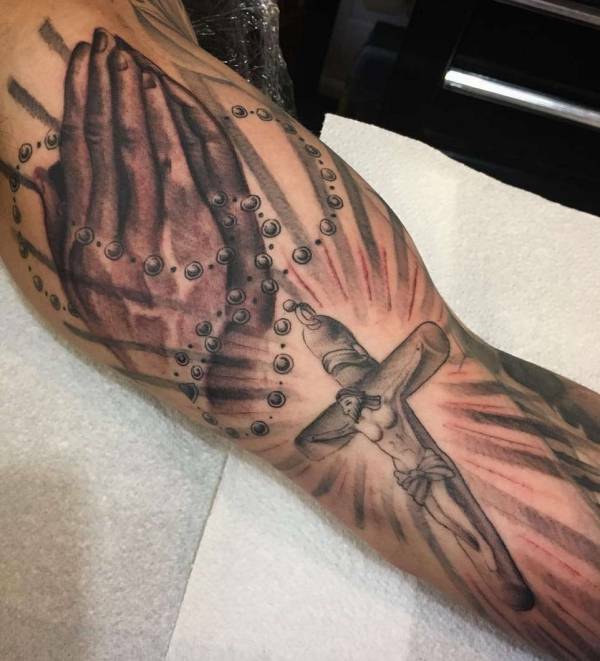 A large cross forms the background of the tattoo, while a smaller one hangs from the hands, dangling with a beaded thread. 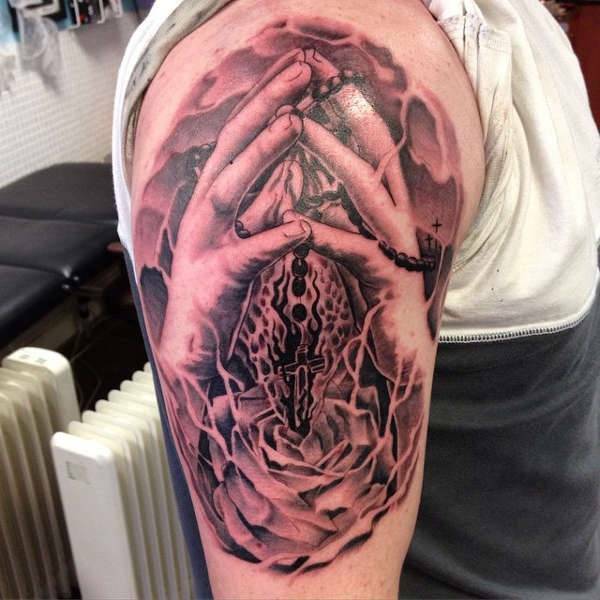 When you opt for hand tattoo designs, make sure that the right shades are incorporated with the ink. You may consider the complexion of your skin before opting for a particular design. 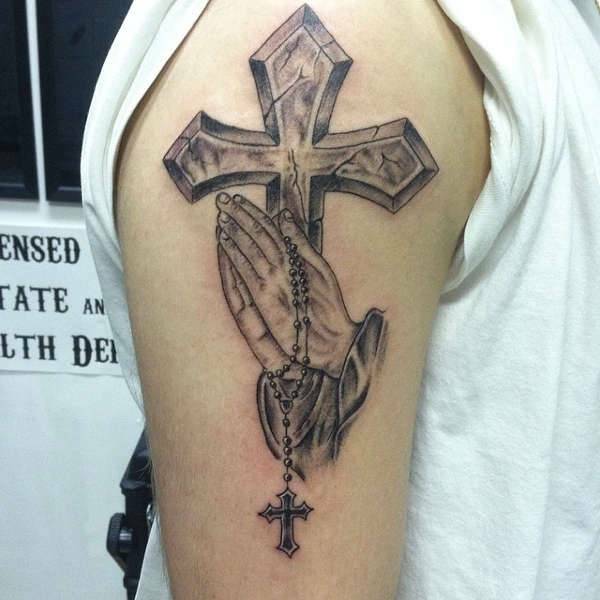 The thickness of the lines and the intricate detail also play a decisive role in the choice of tattoos. Choose the tattoos perfectly to streamline your fashionable looks.